Xiaomi announced Redmi Note in India with two variants and the price of the models are less than what expected. This is a phablet with 5.5 inch, 720 x 1280 pixels and 267 ppi display, 13MP cameras with LED flashes and a 5-megapixel front camera. It have a Li-Po 3200 mAh battery. It have two variants , both will be running on Android 4.2.2 with Xiaomi's MIUI v5 skin. Redmi Note (Dual SIM) – Price INR 8999, 1.7GHz octa-core MediaTek MTK Processor , Mali-450MP4 GPU, 2GB of RAM. Supports 32GB memory card The phone will be available exclusively via Flipkart. Redmi Note 4G (Single SIM) – INR 9999, quad-core 1.6GHz Snapdragon 400 CPU , 2GB of RAM, Supports 64 GB memory card. Android lollipop will be available as a future update on this device. This device is expected to be available via Airtel stores. Flipkart will be launching the Redmi Note on December 2 while the registration will be starting today (25th November 2014) at 6PM IST. Register an Mi account, play and share on Facebook. So you can participate on the Redmi Note giveaway of the Mi website. You need to answer few question to get a chance to participate, each question carries 20 marks. 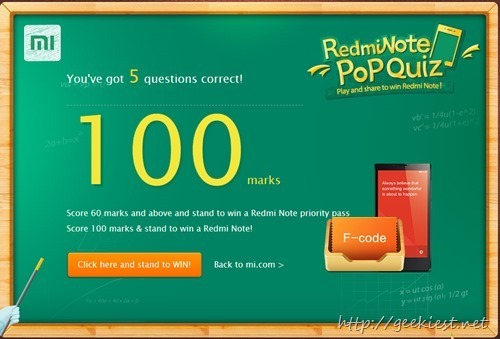 You can win a priority pass if you score 60 or more marks and to get a chance to win a Redmi Note you will have to score 100 marks. Redmi Note registrations will open today, also get a chance to win a Redmi Note.